Painters Faneuil Hall Marketplace in downtown Boston is hosting their first annual Plein Air Paint Out on Friday, September 16 through Sunday, September 18, 2016. The three-day Paint Out invites professional, amateur, and student plein air painters to capture iconic Boston scenes of architecture, markets, crowds, and street performers. Painters are encouraged to use any painting medium over the three days. A final show, group draw, prizes, and two-week exhibition, will offer artists many opportunities to exhibit their work to thousands of daily visitors to the marketplace. Learn more. Free Public Art Workshops UMass Arts Extension Service is offering an Introduction to the Public Art Process workshop. Open to artists of all mediums interested in creating public art projects, participants will receive a broad overview of the unique issues, skills needed, and steps required to create a competitive public art project application at the local and national level. This workshop will include an interactive exercise, information sheets, artist meet-and-greet, and Q & A. Workshop is free and open to the public, but pre-registration is required by contacting AES at aes@acad.umass.edu or 413-545-2360. Learn more for schedule of workshops. Political Cartoons Entries are now being accepted by the South Arkansas Arts Center. To enter, draw an editorial or political cartoon about any current event or political campaign issue of local or national interest. Judging will be based on originality; clear expression of a point of view; and visual presentation using one or more of the tools of a political cartoonist, such as humor, irony, caricature, symbolism, metaphor, sarcasm, and exaggeration. Learn more and then apply. Call to Historic/Cultural Organizations Each season, Luminarium Dance Company of Boston ventures to a new town in Massachusetts to couple with an historical and/or cultural organization for its annual Cultural Community Outreach Project—highlighting the organization through a customized, grant-funded project that integrates dance and the arts with the venue at hand. Past projects took place at key landmarks including: Louisa May Alcott’s Orchard House (Concord, 2012); New England Quilt Museum (Lowell, 2013); Arlington Reservoir Water Tower (Arlington, 2014, and Gold Star Award winning event); Eric Carle Museum of Picture Book Art (Amherst, 2015); Longfellow’s Wayside Inn (Sudbury, 2016). The company has created everything from visual art to choreographic work focused on the organization’s importance as a local landmark within the context of the town, and each project culminates with a live performance held at the institution. Each year, Artistic Director Merli V. Guerra has chosen the venue, but for its 2017 season, Luminarium is turning to you – Massachusetts’ important cultural organizations – to put your name forward as this year’s chosen venue! Learn more and apply. Deadline: Wednesday, October 5, 2016. Film and Video CCTV will host a juried screening of film/video work at MIT’s Bartos Theater on 10/26 that addresses the theme of horror. They are looking for all types of short films and video projects in any category of horror for their Second Annual HorrorFest – International Film Festival. Running time must be under 20 minutes. Submission is free. The screening will be free and open to the public. Learn more. Local Cultural Council Grants The MCC’s Local Cultural Council Program applications are now available. 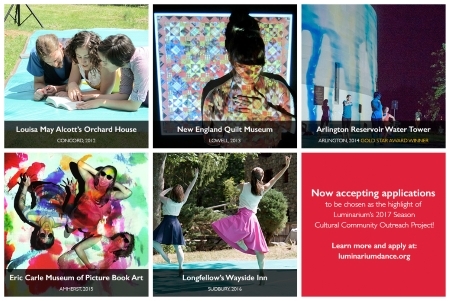 Applicants may apply to the LCC Program for projects, operating support, ticket subsidy programs, artist residencies, fellowships or other activities, based on local priorities and needs. The Massachusetts Cultural Council‘s Local Cultural Council (LCC) Program is the largest grassroots cultural funding network in the nation supporting thousands of community-based projects in the arts, humanities, and sciences annually. Learn more. Greater Boston Playwrights The Huntington Theatre Company is accepting applications for the Huntington Playwriting Fellows Program. The program provides a framework for an in-depth two-year artistic conversation and a long-term professional relationship. Meetings will be held bi-weekly. Submit a recent, completed full-length play. To be eligible, writers must be live at least nine months of the year in the Greater Boston area. Learn more.